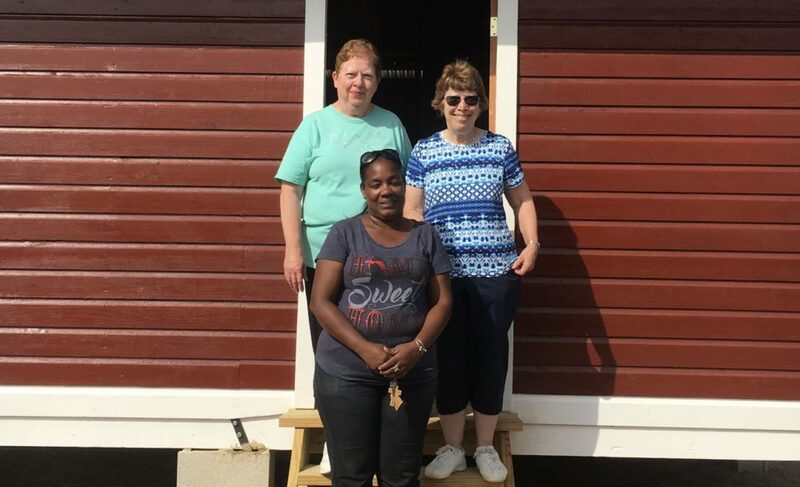 Thank you just doesn’t seem to be enough words for these two blood sisters who have participated in 12 house builds in Belize City with the SCN Lay Volunteer Mission Program. Rita Rodgers and Catherine Paulus continue to let their joy for serving others trickle out into their communities. The number of people that have become connected with the volunteer missions and the homes sponsored in memory of loved ones continues to grow every year. After Rita participated in a volunteer trip to Botswana, Africa, in 2013, she knew this would be her first of many with the Sisters of Charity of Nazareth. In 2014 she financially funded her first house build in Belize, in memory of her husband, David. In 2015, Catherine funded a house in memory of their parents. Since then, St. Ambrose Parish in Belpre, Ohio, and multiple friends of theirs have sponsored builds each year. This year Rita and Catherine participated in two house builds, completely funding one of them. These women continue to be ambassadors in their communities as they share their stories about the beautiful people they have met in Belize and how their hearts are filled with love each time they immerse themselves working alongside volunteers and home recipients year after year. Thank you, Rita and Catherine, for sharing your love with us and may God continue to prosper the work of your hands. Great, good, and generous women! All SCNs thank you. This is a story I intend to pass on to some other sisters. They may need to wait a few years for off-time. but I think they will be touched by what you are doing. Wow, Rita and Catherine congratulations! What you are doing is amazing ! What a gift to Belize!!! Both of these women witness the charism of Love!!!! Thanks for living and witnessing what love means! I am so honored to have them as volunteers and as friends. They both have hearts that embrace so many people . Always giving of their time, energy and support to our missions.